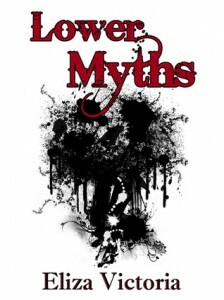 Lower Myths features two compelling novellas of contemporary fantasy from Eliza Victoria, one of the most talented young writers in Asian speculative fiction today. In “Trust Fund Babies,” children of two warring witch and fairy families face off in the final round to a centuries-old vendetta. In “The Very Last Case of Messrs. Aristotel and Arkimedes Magtanggol,” an aristocrat and his daughter consult a famous lawyer-sibling pair about a mysterious crime. But in the lawyers’ hilltop mansion by the sea, they uncover sinister hints that their reality may not be what it seems. 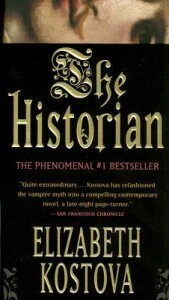 Eliza Victoria’s fiction and poetry have appeared in various publications including High Chair, The Pedestal Magazine, Expanded Horizons, Usok, and the Philippine Speculative Fiction series. I got this one as a sample first, and this was one of the cases where I loved the sample so much that I had to get the book soon after.To be quite honest, I was not sure what Lower Myths was all about, except that it contains two short stories/novellas and the sample just made me want to read on.Trust Fund Babies is a fun, with and fairy story that totally had that mafia feel. It’s violent and can be quite gory, but all done in a tasteful way. I liked the relationship of the families and the idea of the glamour. I can imagine this as a short film with all the effects and the mystery. 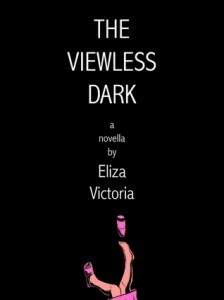 Award-winning author Eliza Victoria mixes magic with the mundane in this special concoction of 16 short stories. A girl meets a young man with the legs of a chicken. A boy is employed by a goddess running a pawnshop. 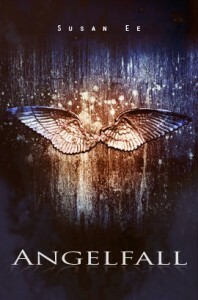 A group of teenagers are trapped in an enchanted forest for 900 days. A man finds himself in an MRT station beyond Taft, a station that was not supposed to exist. A student claims to have seen the last few digits of pi. Someone’s sister gets abducted by mermaids. Includes stories that have appeared in the critically acclaimed anthologies Philippine Speculative Fiction and Alternative Alamat, and stories that have won prizes in the Philippines Free Press Literary Awards and the Amelia Lapeña-Bonifacio Literary Contest. Lower Myths got me craving for more of Eliza’s stories, so when I found out that Visprint released an anthology of her stories, I knew I had to get it. 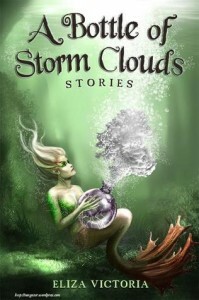 A Bottle of Storm Clouds contains 16 short stories that have appeared in various anthologies, all with the same local fantasy goodness. I was so excited to get this one after the 2nd Filipino ReaderCon (I really, really wanted to win one, but alas, I didn’t) — and I wasn’t planning to read it immediately to save me some local fiction goodness, but I couldn’t wait, either. And so I read. When Anthony found Flo dead, locked overnight in one of the reading rooms of the university library, he knew it must have something to do with Mary. Mary Prestosa, fourth year graduating Philosophy student, whom they had been investigating. Mary, who surprised her roommate one night by suddenly standing up from her bed, throwing the windows open, and jumping down, headfirst, to the dormitory grounds below. Mary, whose memory marked the trail of mysterious deaths and bizarre occurrences that followed her own fateful fall: the fifth-year Computer Engineering student who prowled the campus on all fours, thirsty for blood, believing he was a wolf; the revelation of an all-girls’ satanic cult; the demonic possession of a fourth-year student from the Department of Psychology; and now—Flo, dead. So I read The Viewless Dark around October, because it was supposed to be a horror novel and the best time to read a horror story is during Halloween, right? I was kind of wary, though, because I’m not a fan of anything scary, so I made sure I read this in broad daylight. The Viewless Dark is about Anthony’s friend, Flo, who was found dead in the university library. He knew his friend’s death had something to do with Mary, who committed suicide some time ago, and whose death Anthony and Flo were investigating. Here we see what really happened, and what Anthony knew about Flo that no one else knew and what exactly Flo had been going through the night before she died. Of course I ended up reading this at night, anyway, because I need something to lull me to sleep. And even if I read this in broad daylight, I still felt creeped out every now and then with the story. I liked how the story unfolded from the death of Flo and into flashbacks that pointed just to how exactly Flo ended up that way to what happened to Anthony’s family. I liked how vivid the setting was and how sufficiently creepy the “possession” they set up until the final twist in the end which undid everything I thought I knew. And then Eliza wraps it up in a different way, giving it a poignant, almost hopeful ending. 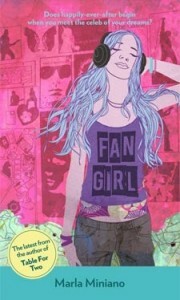 A little background: our book club started out as an online book club that discusses books online but meets offline. When I joined, we didn’t have any book discussions offline, because our meet-ups weren’t always too many. We had about 3 big meet-ups every year from 2010, and then during those meet-ups we just talk books and gave away books and stayed together till everyone needs to go home. Late in 2011, someone came up with the idea to have a 100 Favorite Books List, which birthed the idea of finally having face to face book discussions. I honestly wasn’t sure if it would fly. In fact, I wasn’t even sure if I wanted to go to the first one because I was a bit busy then, and I was going through some personal stuff. But because I was made a moderator by late 2011, I felt that I was obligated to join them for that, even if it was my real first time to join a discussion. But again, we weren’t really sure if we could sustain the momentum, because a monthly meeting almost felt too much, especially coming from the meeting every quarter (not counting the smaller random meet-ups we have). I didn’t want it to die down, but I wasn’t really expecting it to really, really grow into a big event every month, you know?